Lester Ballard, a violent, solitary and introverted young backwoodsman, is released from jail and allowed to haunt the hill country of East Tennessee, preying on the population with his strange lusts. McCarthy transforms commonplace brushes with humanity into stunning scenes of the comic and the grotesque, and as the story hurtles toward its unforgettable conclusion, depicts the most sordid aspects of life with dignity, humour, and characteristic lyrical brilliance. Love it or hate it. I’d give it 51/100. A mere pass. 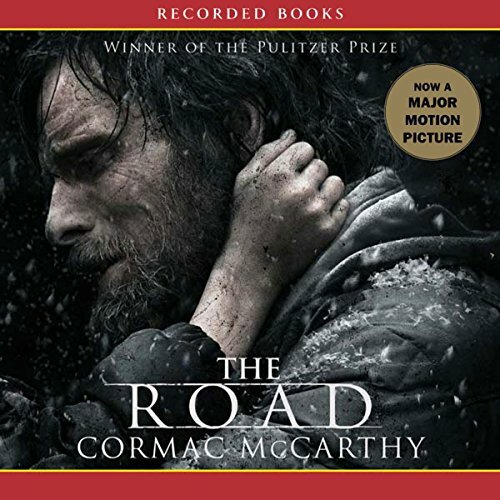 Bleak but brilliant, with glimmers of hope and humor, The Road is a stunning allegory and perhaps Cormac McCarthy's finest novel to date. This remarkable departure from his previous works has been hailed by Kirkus Reviews as a "novel of horrific beauty, where death is the only truth". 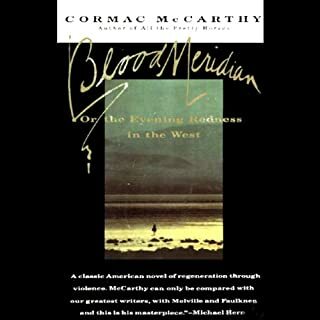 McCarthy, a New York Times best-selling author, is a past recipient of the National Book Award and National Book Critics Circle Award. He is widely considered one of America's greatest writers. Brilliant story, brilliantly read. A disturbing, violent picture of a world in chaos, balanced with a story of a father's love for his child. Absolutely beautiful. The sparse, minimal prose add greatly to the haunting effect of this novel. Loved the narration. Did I mention bleak? Powerful. Pitiful. Full of hope but also despair. A dark story of a man's love for his son pitted against the backdrop of Armageddon. Surviving unspeakable encounters with the dead and the living on their journey to nowhere. Good against evil with no winners. Powerfully narrated. Hard to use the word enjoyable for such a tale but enjoy it I did. Not a book for the faint of heart. Cormac McCarthy writes with such eloquence. This book moved me. There is a potency here of almost immeasurable beauty. I loved this book. Excellent story, loved it! A beautiful tale of love and survival. Want to read more by this author! The Road perfectly captures the strength of the human spirit while silmultaneously showcasing how malicious that spirit can be when pushed to the limit. An absolute must read. This is a stunning narrative by McCarthy. He takes into what’s essentially a two hander - a man and his son. They share their desolate journey through the badlands of a post apocalyptic America with a road that is as unforgiving as it is mysterious. The story line is spell binding and the dialogue is classic McCarthy. It doesn’t get much better than this. Too much of the story is just about their chronological day to day actions. I’ve read many better books that didn’t win any awards. Phenom narrator, even better book. 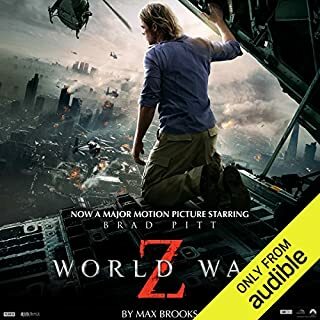 definitely recommend to anyone that's into cryptic post apocalyptic stories. 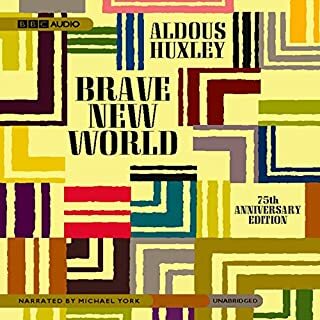 Loved the book and the narrator really added to the telling of the story. Highly recommended! The only benefit here is that it is a short read. Incredibly repetitive, dreary, and disappointing. Perhaps there is a metaphor I missed. 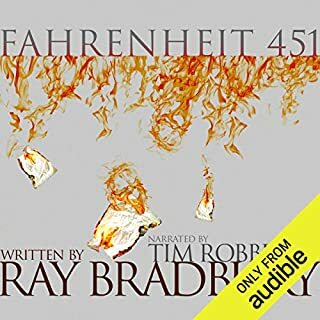 The ending seems totally disconnected with the rest of the book. Very odd that it won a Pulitzer. Apparently this book was written for fathers who have a struggling relationship with their son. This may have been the worst book I've ever heard. there is so much dialogue that is pointless and painful it made me want to put nails in my ears. What would have made The Road better? Story was drawn out and the dialog was... not really enough to be called dialog. 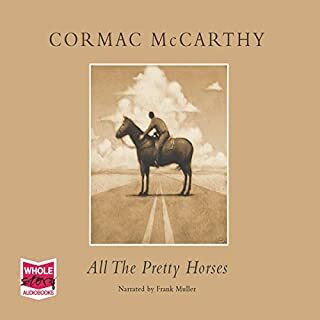 Would you ever listen to anything by Cormac McCarthy again? Would you be willing to try another one of Tom Stechschulte’s performances? 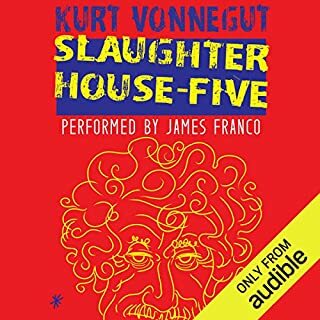 God awful, painful to listen to, and it goes nowhere (much like the characters in the book). I was dumbfounded when I heard this was going to be a movie. Like Seinfeld, it's a story about nothing...we don't know what happened, what is going on, or what happens when they get there. The kid is annoying, and the dad's constant "it's okay" response is overplayed. I actually liked the description of this book too, it seemed promising. the story drags itself througt the same motive "it is dark and cold ..." in endless loops in a very weak string of events. The world is destroyed, burned to ashes... Why? Not important. The book seems to be about how to improvise footwear, the best way to piliage in a post apocalyptic world, and pushing a shopping cart with a bad wheel down the road to nowhere. The boy, born and raised in a post apocalyptic hell, Seemed unfamiliar with survival and seemed to excel at whining so badly that on at least on three occasions I had to yell out loud to my stereo " OH JUST SHUT THE HELL UP! " PAPA, I'm scared. Papa, I dont want to.. Papa.. Son, shut the hell up please. Also, should you find a safe warm place to hide and recover, best get the hell out of there as soon as possible. This book was so boring, I used it to put me to sleep at night. 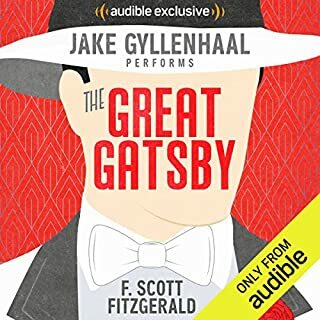 The narrator's voice just could not do a 30's something man and a young boy. He sounded more like a grandfather. It was the same thing over and over. Almost like groundhog day. Walk in the rain, search for food, find shelter, build a fire, decide who is going to hold the gun with the two bullets. Find an empty house, use what you can, take what you can, then head back to the road and do it all again the next day, and the next day, ad nauseum. Which is exactly where this book puts you - just wanting it to all end - for everyone. So depressing and all I kept thinking is "why" - why are they walking towards the ocean, how long have they been walking - how long has this been going on - for the boys entire life - question after question until finally I wonder "why" am I depressing myself trying to get through this book? No good reason - fast forward to the end, listen to the inevitable and turn it off!! 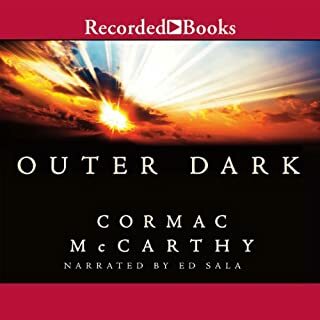 McCarthy's book makes outstanding listening. I was fearful before buying this having read some of his previous books, which are occasionally tough going in their style. But The Road is brilliantly sparse - clipped, original and vivid imagery and a compelling narrative which never explans itself and just keeps you following. McCarthy is a master at avoiding the cliched descriptions of some (many, most) authors and this is the finest example of this, in my humble opinion. The narration is even and atmospheric, with a compelling delivery - just like the story itself. I was in tears at the end of this book - I felt like I was right there at the end with he Son and Father, and I knew them so well it was like saying goodbye to friends. 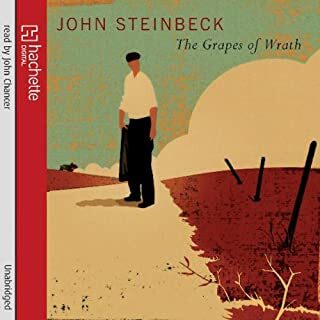 The story is so incredibly well written, you are immediately drawn in to the story and I can picture the landscape so vividly in my mind that I am not sure if I should watch the film adaptation or not. I could very easily have listened to this book all in one sitting, but I had to sleep sometime! Other reviewers have mentioned the lack of chapter breaks, but I think that this is natural to the story - you are seeing through the eyes of the Son or Father, and they are not writing a novel, so they wouldn't break off from their battle for survival to start a new paragraph! 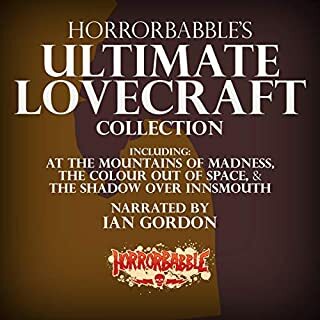 A special mention must go to the excellent narration, which was perfectly paced and judged throughout. I found this book to be a rare example of being worthy of all the praise I have heard heaped upon it. Having read the 2 previous reviews a number of times I was put off listening to this. At the recommendation of a friend I finally took the plunge - I wish I had done so ages ago. 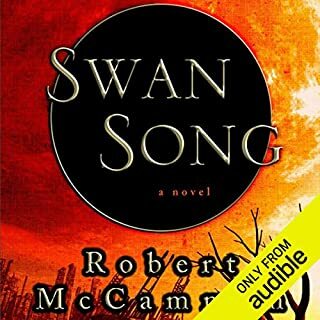 The conversational style and poetic nature make it perfect for audible. The narrator sounded just as I imagined the Father would. I listened whenever I could and looked forward to the next instalment. Occasionally my heart rate rose in anticipation of on-coming violence but overall the story is beautiful. It's biblical themes and believable imaginings of post apocalyptic America are thought provoking. I rarely listen to anything twice but I will make an exception with this. Forget the recent film, this is the real deal. A father and his son travel a road leading towards the South - and a respite from the winter cold. 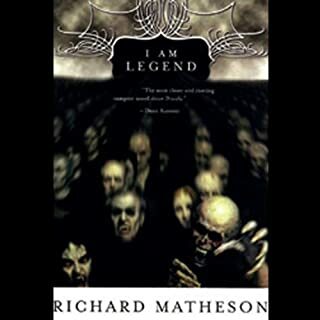 This book makes you ask questions about yourself - could you survive in such an environment? How would you behave towards others? McCarthy's spare writing style is well suited to this type of narrative and it is superbly read by Tom Stechschulte. So Desolate, So Miserable, But So Good! The story painted a picture of a future so bleak it defines the apocalypse genre... The reader did a great job defining the characters and emotions. Great story, short running time and engaging characters. Have you listened to any of Tom Stechschulte’s other performances? How does this one compare? 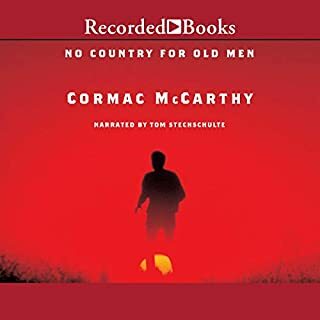 I suspect that a lot of people coming to The Road have, like myself, been introduced to McCarthy thanks to the recent film adaptation of No Country for Old Men, and so this is probably a good reference point. No Country received near universal critical acclaim, but in my experience audience reaction was a little more mixed. Sure, plenty (including myself) agreed with the critics, but many seemed to think the desolate speech, settings, lack of truly cataclysmic events, and the closing dream sequence were entirely off-putting. Well, all of the above factors are present in The Road, in a far greater density than in No Country. Our lead character is in a similar mould to Tommy Lee Jones with his slow, considered speech, there is the lack of a traditional climax, and the story starts with a dream sequence to rival that in No Country. The story follows ?The Man? and ?The Boy? as they travel a road across the southern United States attempting to get to the coast following an unknown apocalyptic event. Needless to say, our travellers encounter both natural and human challenges in this desolate world and these are the main focus. It is worth noting here that, again like No Country, some of these encounters involve extreme violence and extremely distressing images; those of a nervous disposition should certainly beware. From an Audible point of view, the book is of a manageable length and very well narrated. 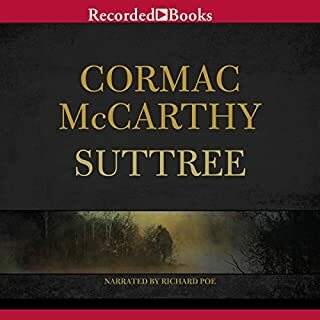 Despite this I do wonder if the inability to dwell on some of McCarthy?s topics means that something lost in the transition from page to wave; perhaps the forced pacing a narrator gives makes up for this, I don?t know. 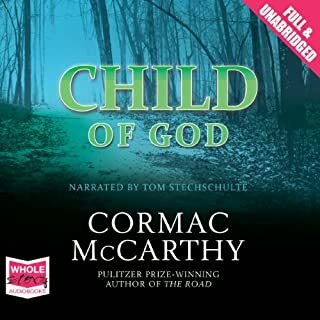 Finally, I always prefer chapters in audiobooks as they allow for a natural breaking point, and these are lacking here. Enjoyed, but the encounters in the book got a little same same. I cried, so that's always a good indicator of an author who has really pulled me into the book and characters. would recommend. 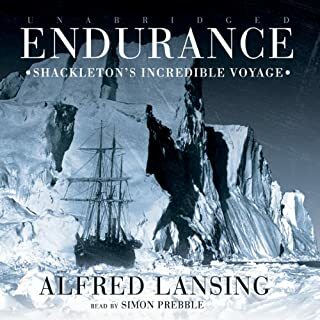 I felt the narrator's voice took a little getting used to but, once I had, this was an enthralling tale of a great book. 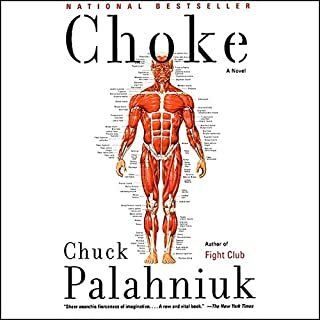 the inherent difficulties of conveying the book in voice were extremely well tackled through a measured narration. The different characters were well handled. The denouement was incredibly moving. Al in all, a superb adaptation: highly recommended. why on earth did this win its accolades? I was drawn by its Pulitzer Prize-winning status and anticipated something original and maybe challenging to the reader. I was deeply disappointed. Science Fiction as a genre is full of examples of much more interesting post-apocalyptic tales. McCarthy has much less to offer here - what others have described as 'bleak', I would characterise as 'dull'. Don't get me wrong, it's competently written and the narrator is okay - it's the content that lets it down. So why the prize? Maybe Science Fiction is beneath the dignity of most literary critics, so they have an inadequate frame of reference? Or maybe McCarthy was deemed worthy on the basis of what I believe to be called 'Buggin's round?' 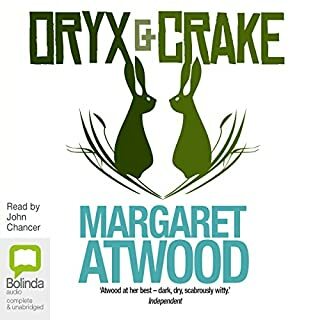 Regardless, for a much more intriguing and satisfying post-apocalyptic journey, I reccommend Audible customers to try Margaret Attwood's terrific 'Oryx and Crake'.